The best way to open and view a PDF file is by saving the file by right-clicking on the file URL and selecting “Save As.” Then, save the file to your computer and open the file on Adobe Reader, which is a free software that you can download from Adobe. Because the PDF file format was created Adobe, their software Adobe Reader is best suited for viewing PDFs. If you are viewing the PDF on your browser, it’s very possible that the in-browser PDF viewer will garble the PDF. This is especially true in Firefox. For the best viewing experience, open the PDF in Adobe Reader, which you can download for free from Adobe. The culprit could be your printer, the software you’re viewing the PDF on, or the PDF itself. To rule out your printer, try printing out another PDF. If you are able to do it, check whether you have the latest printer driver installed. Lastly, try printing from another printer if you have one handy. Some techies say that viewing a PDF in the browser (as opposed to saving it and then opening it) can cause corruption of the file, especially if you haven’t cleared your cache in awhile. This is far from conclusive, but it’s one explanation for why your PDF may not be able to print. If you opened the PDF in your browser, try saving the file to your computer first, opening it in a PDF reader like Adobe Reader, and then printing from there. Alternatively, make a copy of the PDF by right-clicking on it and selecting “Save As.” Replace the file name with another name that includes only letters and numbers. Try printing this copy. Last solution: select “Print as Image” when printing your PDF. Open your printer and select the Advanced button in the Print dialog box to find this option. This is a quick and dirty fix, and Adobe Support has a whole page that guides you through the process. Restart your computer and try printing your PDF again. If you aren’t using Adobe Reader, download it from Adobe (it’s free!) and try printing from Adobe Reader. If you already have Adobe Reader installed, make sure you’re running the latest version. 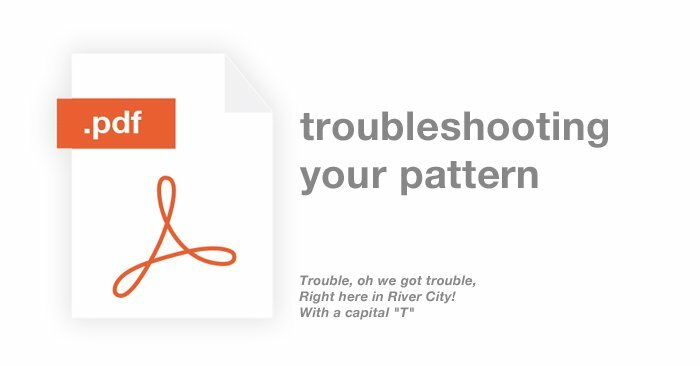 If you’d like the full rundown from Adobe, visit Adobe’s Troubleshooting page for PDF printing. Where Do I Access the Videos For My Pattern? Videos for patterns are on the pattern’s project page. The PDF pattern will include a link to the project page. You can also hover your mouse over “Learn” in the navigation bar of the site and select the pattern from the drop-down menu. Once you’re on the project page, enter your password to access all the tutorial videos. Your password is on the first page of your PDF pattern. Where Is My Password to Access the Videos? The password to the videos are on the first page of the PDF pattern. When entering your password on the project page, make sure that you do not have your caps lock turned on. *** If you have other questions or if these solutions have failed you, email [email protected] and I’ll fly to your rescue! Hey Mara! I got your email and updated email. Do you have your pattern safe and sound now? The yarns are all sold out and we won’t be restocking the TJOCKT yarn. We’re in the process of updating our website so that the yarns won’t show. I’m sorry about that. Hi, i cant seem to view any products on your website. When i click on a product, i get an error message ‘no products were found in your search’. Hey Angela, the yarn and kits are no longer for sale, so that might be the issue. The site is the process of being updated to reflect these changes. Sorry for the confusion! Hey i’m one of your recent customer, and i didn’t realize that i could download the PDF pattern for free for a week and it’s gone now, is it possible to send me the file again? Would really appreciate it. Hey there! I just sent an email to you privately about this, but in case you didn’t receive it, here it is again: Can you email me your order number after you purchased the pattern? Then i can look up your order and send over the PDF pattern to your email asap! You can email me at davina[at]sheepandstitch.com Cheers! Love the tutorials, however, I am having trouble receiving the confirmation email. Please help.